At the rally, Doudou Diène, “Special Rapporteur on Contemporary forms of Racism, Racial Discrimination, Xenophobia and related intolerance” and a scholar from Senegal, spoke. He emphasized that racism is rooted in slavery and colonialism, including settler colonialism. He pointed out that the Israeli occupation of Palestine continues a tradition of settler colonialism and racism. The crowd applauded. Not a heckler was in sight. 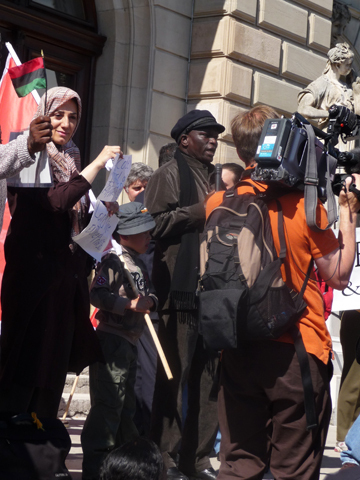 Most of us at the demonstration had heard the news that the U.N. Office of the High Commissioner for Human Rights (OHCHR) – the organizer of the Conference – had attempted to appease the United States and Israel by deleting language supporting reparations for slavery and self determination for the Palestinian people. But the Obama administration’s threat to continue the boycott begun by Bush and Israel in 2001 did not dampen the spirits of the demonstrators that afternoon. 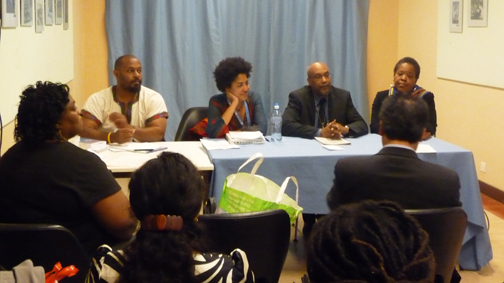 After the demonstration, various NGO caucuses met, many for the first time, attempting to prepare position papers that would pressure the DRC to be more responsive to grassroots anti-racist movements. We were about to learn that we had been thoroughly outmaneuvered. Most were unaware that for nearly two years, hundreds of militant pro-Israeli activists and the Israeli Foreign Ministry had been coordinating their plans to sabotage the DRC. The fiercely pro-Israel NGO-Monitor named at least 17 Zionist organizations that had been “monitoring and protesting” the Durban Review Conference since May 2007 – only a few months after the U.N. General Assembly itself had passed a resolution to convene the Durban Review Conference. At the time, Bush was still president and all the 2008 presidential candidates were competing with each other to be recognized as the staunchest Israeli ally. Israel had no reason to doubt U.S. backing when it took the lead in the international campaign to derail the DRC. Through every U.S. presidency, Israel has been the largest recipient of U.S. foreign aid – currently $3.1 billion in military aid and nearly double that in non-military grants. U.S. aid has built and maintained Israel’s army – the fourth most powerful in the world – the same army that has keeps a defenseless Palestinian population under siege, occupied for the last 42 years and expelled and dispossessed for the last 60 years. Most recently, Israel inflicted 22 days of relentless ‘round-the-clock bombing on the sliver of land of Gaza where 1.5 million Palestinians are caged. That bombing killed some 1,400 people, wounded 4,336 and terrorized the entire population. Israel perpetrated this crime against humanity with impunity, confident of the support of the Obama administration and most European allies. 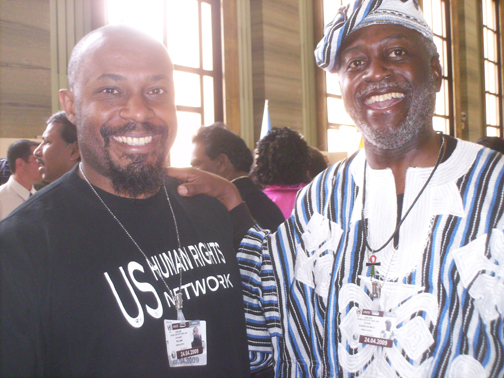 In Durban, the 2001 Worldwide Conference Against Racism (WCAR), sponsored by the U.N., cracked Israel’s hegemonic narrative of the “the Middle East conflict.” The final Durban Declaration and Program of Action (DDPA), signed Sept. 8, 2001, by all U.N. members except the U.S. and Israel, reflected the even-handed diplomacy of the world’s official state representatives. Despite the declaration’s moderation, the U.S. and Israel denounced it as “anti-semitic” and walked out. The corporate media echoed the pro-Israeli narrative that demonized the Durban Conference as an “anti-semitic hate fest.” Then, before the U.N. or any of the 150 countries that signed the declaration could defend it, the Twin Towers were bombed. The Western corporate media sealed the reputation of Durban in a tomb of anti-terror, anti-Muslim hysteria. How convenient for the Zionists to resurrect the misrepresented ghost of WCAR in order to launch their campaign to discredit and derail the 2009 Durban Review Conference. Before any reader jumps to the conclusion that this author is resorting to the traditional anti-semitic canard by creating a fictional “Zionist conspiracy,” please note that Michael Jordan, frequent contributor to the pro-Israel online news service JTA, openly bragged about the power of their plot. The cornerstone of the plan was to campaign for an international boycott of the conference and then to accuse any critics of being anti-semitic. “The World Jewish Congress met with officials from 17 U.N. member states to push for a boycott. Hudson Institute scholar Anne Bayefsky banged the anti-Durban drum for months in the U.S. media, including the National Review, the New York Daily News and Forbes. And Israeli officials pressed their allies that intended to participate in the conference not to tolerate any anti-Israel resolutions. The Jerusalem Post, Israel’s newspaper of record, reported frequently on the growing lobbying efforts to render the Durban Review Conference irrelevant by convincing the “world community” – read Europe and the U.S. – to boycott it. A Sept. 28, 2008, article specifically detailed a concerted three-pronged strategy: 1) To call for states to boycott the conference; 2) To urge governments and private donors not to fund either the conference or the NGOs; 3) To organize and galvanize a pro-Israeli presence at the conference. While the article didn’t publicize it, the strategy also involved pressure from inside the U.N. – especially the U.N. Office of the High Commissioner for Human Rights – through staff members who were relatively pro-Israel. Virtually all pro-Israel forces were mobilized to press for boycott. During the presidential campaign, Obama shamelessly pandered to the American Israel Public Affairs Committee (AIPAC) – the influential lobbying organization. Yet he also had a huge political debt to Black voters and had encouraged his candidacy to be used as an anti-racist symbol. Thus, many of his supporters were shocked Feb. 27, 2009, just five weeks into his presidency, when Obama declared the U.S. would not attend the U.N. Durban Review Conference unless its outcome document were changed to drop all references to Israel, reparations for slavery and the defamation of religion. However, Obama’s spokespeople added that they would be prepared to re-engage if the negotiations brought about a “shortened” text of the document that met their criteria. Encouraged by the Obama administration’s open endorsement of Israel’s year-old boycott, Zionist forces intensified their campaign to widen the boycott to destroy any possibility of a successful conference. For example, on March 9, 2009, The Jerusalem Post reported that Dr. Moshe Kantor, president of the European Jewish Congress – an umbrella organization for many Zionist organizations – called on the European Union to boycott the conference. While only a handful of European countries followed the lead of U.S. and Israel, the threat of a wider boycott accomplished another objective. On March 17, conference organizers announced their attempt to appease Israel, the United States and their fence-sitting allies by revising the Draft Outcome Document. They removed all references to Israel as a perpetrator of racial discrimination, cut out any mention of the Palestinians’ right to self determination and also excised all language related to reparations, an acknowledgement that the transatlantic slave trade was a crime against humanity and a proposal to strengthen the Working Group of Experts on People of African Descent. But fearing resistance from the Non-Aligned Countries, African countries and other Islamic countries, conference organizers balked at Obama’s final demand to totally renounce the hard-won Durban Declaration and Programme of Action (DDPA) of 2001. In addition to pressure for boycott and weakening the conference’s anti-racist program and documents, the Zionist strategy aimed to withhold funding from the U.N. conference itself and potentially hostile NGOs. The U.N.’s budget only met part of the conference’s needs. The rest had to be raised from voluntary contributions from states and civil society, including major philanthropists like Ford and Soros Foundations. It is possible that Zionist pressure on the U.S. and other governments to withhold funds from the U.N. backfired. With no funds from the U.S., funds donated by Iran, Libya and others became more significant. However, the campaign to starve the NGO Forum and any individual NGO that didn’t tow the Israeli line had more success. In October 2008, the NGO Monitor sent an open letter to U.N. Secretary General Ban Ki-Moon calling on him to “avoid providing official sponsorship or funding for another NGO Forum that is likely to be a venue used to promote hatred and anti-semitism.” Various other Zionist organizations – including the Simon Wiesenthal Center, the American Jewish Committee and Human Rights First, sent similar letters. In 2001, the NGO Forum in Durban included 8,000 people and lasted more than a week. U.N. and other financial support enabled many grassroots people to participate and radicalize the process. The forum’s political influence was significantly responsible for the U.N. DDPA’s endorsement of reparations, self-determination for the Palestinian people and generally strong stand against racism. Israel’s strategy for 2009 was to torpedo any NGO Forum with the potential of exerting an anti-Zionist influence. In preparatory meetings, each time NGOs called for an NGO Forum in Geneva in 2009, Jose Dougan-Beaca, the coordinator of the Anti-Discrimination Unit of the OHCHR, emphasized that an NGO Forum was impossible because of “lack of money and facilities.” Dougan-Beaca was responsible for conveying information in both directions between the NGOs and the OHCHR. But a delegate from Independent Jewish Voices of Canada who attended those meetings reported that he became a partisan advocate for the pro-Israel NGOs. The pro-Israel Magenta website published detailed reports of those preparatory meetings. Those reports confirm Ralph’s impression. In addition to citing financial constraints, Dougan-Beaca attempted to lower the NGOs sights for the conference by emphasizing the DRC was mandated to be a review conference, not intended to expand on the DDPA. Therefore it would be appropriate for NGO attendance to be much reduced and NGOs should not attempt to strengthen the DDPA. In the end, rather than a fully funded official NGO Forum, barely 300 NGO representatives straggled into private venues away from the U.N. complex on the weekend before the DRC convened. 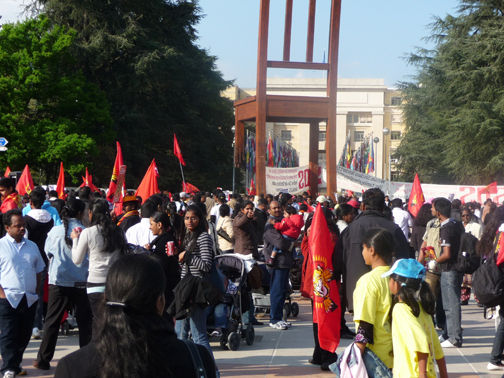 And fewer than 1,100 authorized NGO delegates were able to come to Geneva at all. During the conference itself, pre-authorized “side events” that featured speakers on approved topics were supposed to meet the NGO need for a political platform. These side events reflected both Israel’s and the U.S. agenda. Two weeks before the conference began, for example, the Office of the High Commissioner for Human Rights informed a Palestinian Refugee Rights Organization (Badil) that Palestinian-related side events would not be permitted. There was no such restriction on pro-Israel events. It is important to understand that the campaign continues to financially strangle anti-racist NGOs that may criticize Israel. On April 26, the day after the conference adjourned, in a piece titled, “Geneva Walkout Isn’t Enough” (www.ynetnews.com), Diane Meskin praised the NGO Monitor’s campaign to cut off funding for all anti-Israel NGOs. She wrote, “The EU has much to do if it truly wants to fight anti-semitism, racism and the perpetuation of anti-Israel propaganda on the world stage. It must put its money where its mouth is and stop funding NGOs that use these funds to promote the delegitimization of Israel …” She explicitly named funding organizations that must cut off named grantees – many of whom have supported a diversity of anti-racist causes. Pro-Israel forces at the conference had their marching orders: Protect Israel from criticism of its most recent genocidal blitzkrieg and invasion of Gaza and gag any discussion of the occupation of Palestine itself. Uniformly, pro-Israeli groups worked to keep the focus on Iran, the holocaust, anti-semitism and Muslim complicity in Darfur. They talked about the persecution of the Roma and about Rwanda, but attempted to silence all mention of land seizures, the apartheid wall, separate roads, checkpoints, home demolitions, economic strangulation, mass incarceration, theft of water and all the other racist assaults on the Palestinian people. Throughout 2008 and during the months of 2009 leading right up to the conference, meetings of the Preparatory Committee in Geneva, Regional Meetings in Latin America, Africa, Europe, Asia and among the Islamic States and Intersessional Meetings all invited input from NGOs. Those NGOs with closer ties to the grassroots were invariably poorly funded and could not afford travel and lodging in Geneva. Thus, NGOs more closely linked to governments – especially pro-Israel NGOs – had a disproportionate presence at the preparatory meetings. Reports by I-CARE’s representatives at those meetings reflect Israel’s particular concern with both the influence and composition of the Bureau of the Preparatory Committee that had responsibility to “prepare the agenda and draft decisions for consideration by PrepCom and address all issues pertinent to its work …” Ms. Najat Al-Hajjaji, the permanent ambassador from Libya to the U.N. in Geneva and past chair of the Human Rights Council, chaired the bureau. Bureau “vice chairpersons” from the Global South outnumbered delegates from Europe 11 to 7, and the Cuban ambassador to the U.N. in Geneva, Resfel Pino Alvarez, who is also the respected chair of the Non-Aligned Movement, was named vice-chairperson-rapporteur. According to www.unwatch.org, there were a total of 314 newly-registered NGOs with a total of 1,073 delegates at the DRC and some 370 delegates belonged to only two of the Jewish student unions that attended. If the delegates from all the myriad pro-Israel organizations and media are counted, it is likely that more than half those who attended the conference in Geneva came with the sole purpose of building a pro-Israel presence and preventing any anti-Israel expression. From the first day of the conference we saw the waves of disruption of Ahmedinejad’s speech – coordinated in both the General Assembly and the NGO auditorium. Some 200 pro-Israel activists then attempted to block the entrance to his press conference. Similar disruptions of side events frustrated attempts to discuss Islamophobia. And large well-publicized panels and carefully-orchestrated rallies that featured famous Zionist celebrities were sympathetically reported by a compliant Western corporate media. Even within the U.N. OHCHR, at least one press officer gave pro-Israel statements to the press. All this made many non-Zionist participants feel that pro-Israel forces had hijacked the conference with military-like planning and precision. By the second day, NGO advocates for reparations, land for the landless, the rights of Dalits, self-determination for the Palestinian people and a myriad of other anti-racist demands began to regroup. But suddenly, the U.N. OHCHR announced that the “Outcome Document of the DRC” would be approved by consensus before the close of the second day of the five-day conference. There would be no opportunity to repair the damage done by the U.N. OHCHR’s appeasement of the U.S. and Israel’s demands. Nevertheless, a group of African and African Diaspora NGOs, progressive Islamic NGOs and those in solidarity with the Palestinians, migrants and many others continued to meet informally and strategize. They vowed to continue the struggle for recognition of their demands in other venues – including, perhaps, a Durban 2010. Anti-Zionist Jewish organizations – whose presence at the conference was totally eclipsed by the pro-Israel forces – had met earlier and were heartened by the growing strength of the BDS movement to press for boycott, divestment and sanctions against Israel. In the end, only 10 countries – all European or European-settler states – boycotted the DRC. At least 17 state delegates expressed disapproval of the boycott in their official statements. In the language of diplomats, they denounced the boycott as revealing a lack of commitment to overcoming racism. More than 100 remaining delegates implicitly criticized the boycott orchestrated by Israel and the U.S. But in the end, perhaps in order to prevent the majority of European countries from following the boycotters, the Outcome Document was silent on these issues. Moreover, Ban Ki-Moon and Navi Pillay explicitly repudiated Ahmedinejad’s speech, which had affirmed Palestine’s right to self-determination. Pillay admitted in her press conference on April 24 that she believed her denunciation of Iran was the price the EU demanded not to join the boycott. Except for Argentina, the 15 countries that explicitly denounced Iran were all European. Some 18 countries – none of them European – explicitly supported the Palestinian people’s right to self determination and criticized to varying degrees Israel’s denial of Palestinian rights. Most of these, plus Azerbaijan and Pakistan, were among the 15 that called for stronger measures against Islamophobia. Finally, 16 countries – all except Japan from the Global South – expressed concern for protecting migrants against racist attacks and the final Outcome document included protections for migrants that most European countries had opposed. In sum, about half the delegates took definite stands in their speeches on the most controversial issues of the conference. Their stands demonstrate the endurance of North-South oppressor-oppressed relations. Israel is a bastion of “European civilization,” a settler colonial state, on the edge of the African continent. To survive as a Jewish state – by definition an apartheid state – Israel is perpetually consolidating and expanding its narrative that turns the reality of its racist colonial project on its head. The global hegemony of U.S.-led imperialism is cracking. U.S. and European complicity with Israel demonstrates how white supremacist states will increasingly join forces and circle the wagons when threatened. The U.N.’s Durban Review Conference once again dramatized a lesson many learned long ago: Appeasing settler colonial, neo-colonial and imperialist powers only emboldens them. The Palestinian Authority and other Muslim States (including Iran) agreed to a “consensus” document that omitted any mention of Israel or Palestine. The African and Caribbean States signed onto a “consensus” document that omitted mention of reparations. But the U.S. never compromised in its unconditional support for Israel and opposition to reparations. Hopefully those NGOs and others who argued, “Let’s just focus on our issues. The Palestine-Israeli conflict is just a distraction from the real struggle against racism,” learned from Israel’s campaign to destroy the conference. Just as the U.S., Europe and those bribed by them are united in their project to maintain their hegemony, African and African Diaspora people, Asian and indigenous people – all colonized and formerly colonized people – need unity. www.worldjewishcongress.org identifies the WJC as an international organization which represents organizations in 80 countries from Argentina to Zimbabwe. It has headquarters in New York City, a research institute in Jerusalem and affiliate offices in Brussels, Budapest, Buenos Aires, Geneva, Johannesburg, Moscow, Ottawa, Paris and Sydney. The WJC Office in Geneva hosted the “International Jewish Caucus at the DRC” even though it had called for states to boycott the conference at its January 2009 Plenary. Diana Ralph. “No Anti-Semitism at Durban II: Canada Should End its Boycott.” Outlook Magazine. Vol 47 #1, Jan/Feb 2007, pp. 17-18. From Africa, the vice chairs included representatives from Cameroon, South Africa and Senegal; from Asia: India, Indonesia, Iran, Pakistan, Turkey; from South America: Argentina, Brazil, Chile; and from Europe: Armenia, Croatia, Estonia, Russia, Belgium, Greece and Norway. Some of the Zionists organizations with delegates in Geneva were World Jewish Congress, American Jewish Congress, European Jewish Congress, Australia/Israel and Jewish Affairs Council, Canadian Jewish Congress, International League Against Racism and Anti-Semitism, The Simon Wiesenthal Center, B’nai Brith Canada, B’nai Brith International, International Association of Jewish Lawyers and Jurists, Human Rights First, Rabbis for Human Rights, Hadassah, Jewish Council for Public Affairs, Jewish Council for Racial Equity, Union of Jewish Women of South Africa, Institute for Advancement of Human Rights, American Jewish Committee. Brazil, China, Cuba, Ecuador, Organization of Islamic Councils, Indonesia, Iran, Lesotho, Namibia, Nigeria, Norway, Spain, Sri Lanka, Swaziland, Tanzania, Uganda and Uruguay. U.N. Secretary General Ban Ki-Moon, U.N. High Commission for Human Rights Navi Pillay and a number of others explicitly criticized the boycott. Twelve countries explicitly advocated for Reparations: Angola, Barbados, Cuba, Guyana, Haiti, Iran, Jamaica, Libya, Namibia, Suriname, Tanzania and Zimbabwe. Many others suggested that former colonial countries had the responsibility to ease poverty, forgive debt and assist in the economic development of the Global South. Argentina, Austria, Belgium, Denmark, France, Ireland, Lithuania, Luxembourg, Norway, Portugal, Slovenia, Spain, Sweden, Switzerland, and United Kingdom. Argentina, Burkina Faso, Cuba, Ecuador, Greece, Haiti, Honduras, Japan, Jordan, Mauritius, Mexico, Nigeria, Philippines, Senegal, Tanzania and Turkey. Arlene Eisen is a writer based in San Francisco, who, since the 1960s, has been active in anti-imperialist struggles. Most recently she edited Second Lines, the newsletter of the Peoples’ Hurricane Relief Fund, traveled to South Africa where she joined a project to document the Black Consciousness Movement and participated in the United-Against-Racism-U.S.A. delegation to the U.N. Durban Review Conference in Geneva. She can be reached at arlenesreport@yahoo.com. 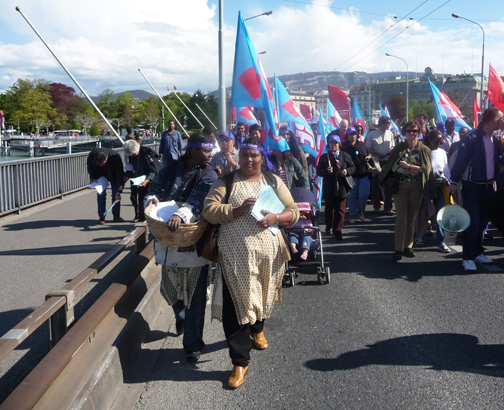 Join a discussion on Thursday, May 14, 2 p.m. EST, 11 a.m. PST, about the news from the Durban Review Conference last month in Geneva that was not reported and how activists participated in the conference despite attempts to derail it. The discussion will also cover an agenda to move the Durban Plan of Action forward and hold the U.S. accountable to the International Convention on the Elimination of Racial Discrimination. To join the call, register here. Member organizations reporting back include Cidadao Global, Latin American and Caribbean Community Center, Malcolm X Grassroots Movement, Mississippi Workers Center for Human Rights and Urban Justice Center. The moderator is Janvieve Williams and participants include Kali Akuno, Ejim Dike, Jaribu Hill and Ramona Ortega. This article is pure anti-Israel propaganda! With all the racism in the world today, why was Israel the single focus of the UN conference? What of Darfur? What of black Cubans? What of Egyptian Copts? What of Iranian Bahai’s? What of non-Muslims in Saudi Arabia? What of the Kurds in Iraq, Turkey and Syria? The so-called “Palestinian” people didn’t exist before 1964, yet are always in the world spotlight. Why? Certainly not because they truly deserve to be, but solely, and I repeat, solely because of their animus for the only Jewish State, Israel. Spontaneous generation has been proved by joelsk44039! The “Palestinians” were teleported into the universe in 1964, therefore they are unworthy of any sense of place, unlike the Jews who were briefly away from home but rushed right back when Fake-estinians began displaying phony property deeds to the rightful dwellings of Jews. So, the Real Victims were forced to stage exemplary massacres to encourage Fake-estinians to move to Jordan where they belong, and after the Fake-estinians left, their alleged villages where dynamited wholesale and proper Hebrew names were assigned to those VERY Jewish places. Ah, yes. Sticks and stones (and all that) cannot alter the facts. Call me names, bend what I say, but the fact is that the Arabs of then Palestine (circa 1948) had no sense of peoplehood until 1964, when they “established” themselves as such, for the exclusive reason to destroy Israel. Congo Genocide: Will Obama’s America collaborate or refuse?